When someone professes to have a photographic memory, the first thing many people ask them is to name the day of the week on which a random date landed. Often, they do it easily, and everyone around is sufficiently impressed with their memory. Unfortunately — or fortunately, for those without such a gift — naming the day of the week of a date doesn't require a photographic memory: just some quick mental arithmetic. Anyone can do it using the doomsday rule, a simple algorithm devised by mathematician John Horton Conway. Some of the dates that always fall on "doomsday" are easy to remember, like 4/4, 6/6, 8/8, 10/10, and 12/12. It takes an easy mnemonic device to recall some others. For instance: 5/9, 9/5, 7/11, and 11/7 can be remembered with the sentence "I work 9 to 5 at the 7-11." There are also a few one-off doomsday dates: March 14 (3/14 or Pi Day, for those who use the day-month format) and the last day in February (regardless of leap year). In non-leap years, January 3 is a doomsday; in leap years, January 4 is. Once you have those dates memorized, you can calculate the weekday of any other date via its proximity to a doomsday. For example, what weekday did Dame Judi Dench's birthday, December 9, land on in 2015? That year's doomsday was a Saturday, so we know that 12/12 landed on a Saturday. The 9th is three days before the 12th, so Judi Dench's 81st birthday landed on a Wednesday. If you don't know a year's doomsday, though, figuring it out can be tricky. It's not so bad for the recent past. Every new year, the doomsday moves forward one day (so from Tuesday to Wednesday, or from Sunday to Monday). On leap years, though, it moves forward two days. This isn't so hard to wrangle if you stick to dates in the 2010s, but it's tougher to think through for a date in, say, 1392. 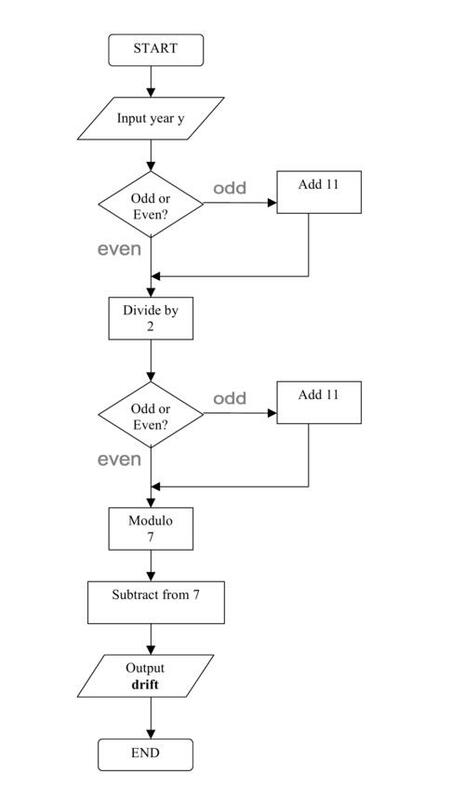 Even a newly-streamlined process for calculating a given year's doomsday means using this somewhat daunting flowchart. Once you've mastered it, though, you'll have a party trick for the ages! Conway sure did. He had programmed his computer to quiz him on random dates' days of the week; he could usually answer (correctly) in less than two seconds. For more impressive mental feats, check out "Secrets of Mental Math: The Mathemagician's Guide to Lightning Calculation and Amazing Math Tricks" by "mathemagician" Arthur Benjamin. We handpick reading recommendations we think you may like. If you choose to make a purchase through that link, Curiosity will get a share of the sale.